The start of another year has come around quietly on the farm. Our feed has finally given up, so we are hand feeding stock at the moment, hay and pellets. We are just waiting for the autumn break now, to green up the pastures again. The does are quietly enjoying their time off - no kids suckling on them, and they wont be pregnant for a little while either. 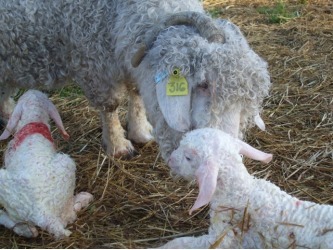 Our show team continues to flourish with some beautiful little Angora doe kids. 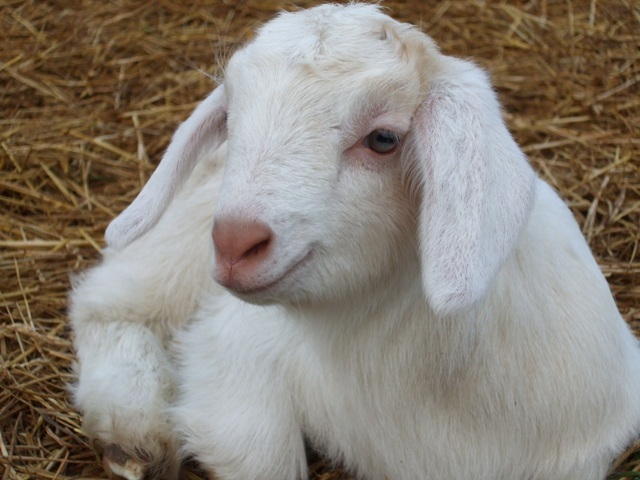 We are extremely excited to announce two new arrivals at Pacqio - Dotti, a British Alpine doe kid, and Bullseye, a Toggenburg wether kid. These gorgeous kids came from Emmeline McCubbin, and we thank her immensely. Dotti is a stunning little doe who will be travelling to Canberra show alongside the angora kids, and Bullseye is a star performer, as he is trick trained. 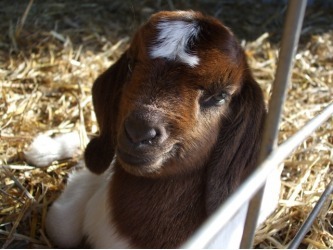 November has been a quiet month - the show circuit is over and the animals are just happy in the paddocks being animals. The babies continue to grow like weeds, and the angora kids are looking stunning with their true mohair ringlets starting to come through as they shed their baby coats. We are very impressed by Heath's first kids born this year, and so happy that they are all girls. We had a surprise kidding with Phezulu Lulu (who we did not think was pregnant) having a little buck kid. Unfortunately she had him in the middle of a cold storm and he did not survive. However, she is now playing foster mum to a little orphaned boer buck, who she absolutely loves. We are also excited to announce the addition of three Anglo Nubians to our dairy herd; photos of Lily, Binx and Raffy will be up soon. We plan to show Lily in 2010. Well, what a whirlwind October has been so far! The show team are back from Melbourne show, and happy to be back home away from the hustle and bustle of the busy show days. We had a very special addition to the show team while at the show - Micathel Linus kidded with one doe kid - Pacqio Lexie. Linus had her baby early on Saturday 26th September, and little Lexie stole the attention and hearts of many many people at the show - both public visitors and other livestock exhibitors. This month has seen a shift in the home base of Pacqio Stud, although not too far down the road. We have moved to Wodonga, Vic, just on the other side of the border. And now for a September update - the kids are 1 month old and amusing us with their clever little antics, bouncing around all over the place. They are growing like weeds - and we are pleased to say the weeds (and pasture) is growing well also; we have received some good rains and the animals are enjoying a green pick of feed. September sees the Angora herd of Pacqio being relocated, just down the road to Gerogery; this new property is only half an hour from the property at Yerong Creek. The Gerogery property allows us better and closer access to our Victorian clients, as we are only 20 mins from Albury Wodonga, on the NSW-Vic border. We can arrange for you to view ANY of the animals, or any breed, on either the Gerogery or Yerong Creek property, so please do not hesitate to ask. Show preparation is a never ending story and September sees us trimming feet and hair to get these animals looking their best for the show. 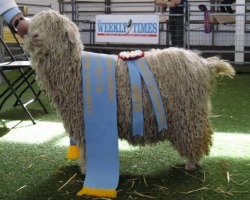 Melbourne Royal is our first show of the season and also the biggest; we will have Damara sheep, Angora and Boer goats on display at Melbourne Royal for the duration of the show, from the 17th to 27th September, so come along and check us out, introduce yourself and meet the animals. We are pleased to add a Damara ram lamb, who is being bottle fed, to our herd. 'Mackadoo' is a stunning and growthy black and white ram who will be our future stud sire. More information and photos of Macka will be added to the Damara ram page. Stay tuned for details of our show results. August has arrived and so have the kids! We have had a very short kidding season, with most of the does kidding within a week. We have had plenty of multiples - triplets and twins. We have also had plenty of doe kids (9) and only 2 buck kids. 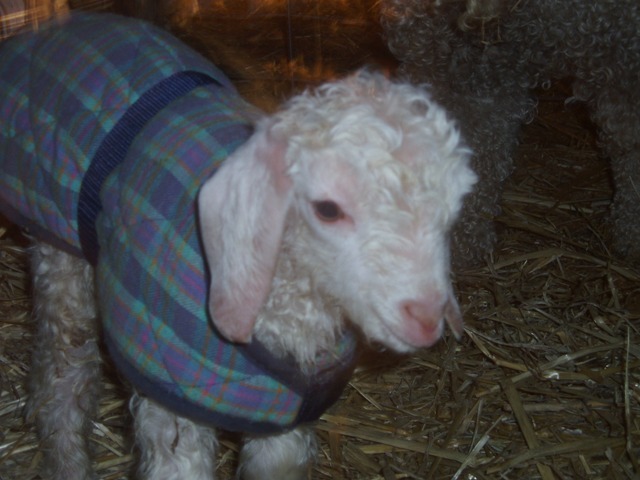 This years kids are by Padre (FB Boer) who was joined to the Boer and Dairy does, and Heath (Angora) who was joined to the Angora does. Check the website regularly for pictures of the kiddos as they grow. Show preparation continues for the spring show circuit which starts in September (for a full list of shows click the link below for June news). Days are getting longer and warmer and the grass is growing, though like most people we could do with a little more rain to keep things going. We are currently gearing up for show season. The spring show circuit begins the first weekend of September and concludes midway through November. We will be attending the Royal Melbourne show as well as many local shows. Over the past few weeks we have been scrutinising our animals in order to decide which will be included in our show team. Entries are now ready to be sent away and we expect to show 10 Angora goats, 8 - 12 Boer goats, 2 - 8 Damara and crossbred sheep. These animals are now being put onto grain rations in order to increase their weight to 'show condition' and we are teaching them all to walk on a halter and lead, and behave themselves in the show ring. Please note this list comprises all possible events we may attend; however we may not attend all of these shows, and we may not bring the entire show team to each show, so if you are planning to view a breed in particular at your local show, please contact us prior to the show to confirm our attendance. Results from these shows will appear in this section several days after the show's end.